BMC & Castrol Oils Service Sticker. 4". BMC Barrel & Coloured Rosette Banner Art. 43" x 30". 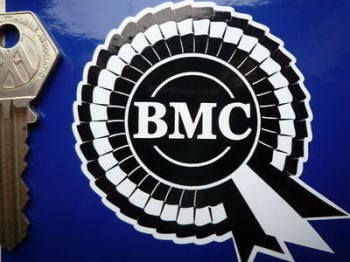 BMC Black & White Rosette Stickers. 3" or 4" Pair. 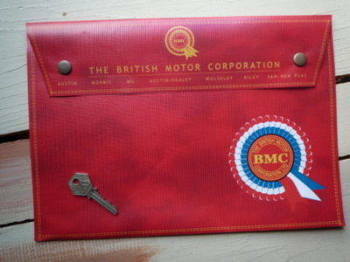 BMC British Motor Corporation Rosette Banner Pennant. 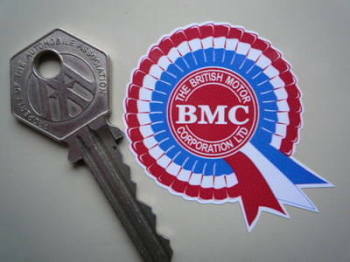 BMC British Motor Corporation Rosette Window Sticker. 4". 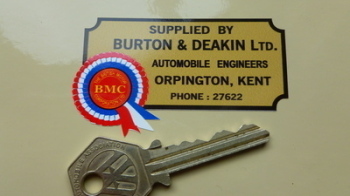 BMC Burton & Deakin Automobile Engineers Kent Dealers Sticker. 2.75". 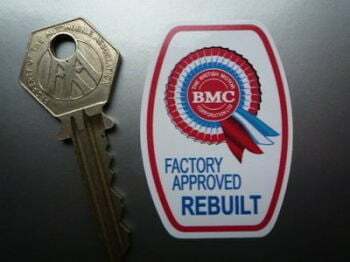 BMC Factory Approved Rebuilt Components Sticker. 2". BMC Fire Extinguisher Sticker. 5.5". BMC Flag & Scroll Sticker. 4". BMC Genuine Parts Barrel Stickers. 2" Pair. BMC Jet Fire Extinguisher Foil Sticker. 3.5". BMC Jet Fire Extinguisher White Sticker. 3.5". BMC Large Flag & Scroll Sticker. 11". BMC Man with Flag Stickers. 4" Pair. BMC Mini Tractor Stickers. 5" Pair. BMC Mowog Spares Dealer Stamp Service Sticker. 3.5". BMC Mowog Spares Listed Brands Sticker. 2". BMC Off White Style Rosette Window or Sticky Backed Sticker. 14". BMC Parking Only. London Street Sign Style Sticker. 3", 6" or 12". BMC Premier Motor Co. Erdington Birmingham Dealers Sticker. 2.75". 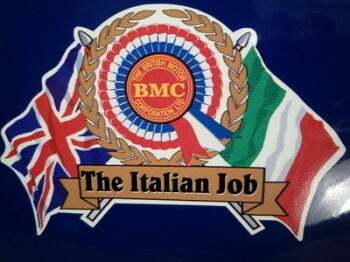 BMC Red, White & Blue Mini Rosette Stickers. 2" Pair.